Where Do You Think You’re Going With That Baby? When they talk of raving fans in the world of social media, it applies to me and my following of Valerie Khoo. I read anything she writes in regards to her role as Founder and Director of the Australian Writers’ Centre. I listen to her podcast on a weekly basis, and I follow her updates on Facebook regularly. This morning’s update had nothing to do with writing and everything to do with my world – babies and travel. Valerie is in the US at the moment and had boarded a plane. “So this just happened” was the update. Underneath the post was a picture of a ziplock bag with chocolate and candy with a note, a preemptive apology, from a baby. Yes, the baby had typed up and printed a quick introduction and a small note of apology just incase she upset anyone throughout the flight. What? Your baby couldn’t write at three months? Okay, so we all know the baby didn’t write the note. The parents did, they actually made their note into a small cutesy poem which I imagine is already raising the bar in what seems to be a new phenomenon in the world of baby travel. The first time I’d heard of the baby apology was in 2012, when the parents of twins handed out these to their fellow travellers. Now because this is 2012 this is the original model – basic candy and lollies. In 2015 it appears parents are stepping things up a little, the ear plugs now come in the bag, and the chocolates are a little more high end. This is what happens with anything involving children. It starts with a basic idea that is then improved. What began with a home make packet cake and a game of pin the tail on the donkey then becomes a three tiered gluten free replica of the set of The Wizard of Oz and a visit from David Beckham who pins a tail on a unicorn that was supplied by Franz the Under 10’s party planner. By 2017 I imagine parents will have managed to raise the bar again; zip lock bags will disappear and be replaced with designer pouches loaded with vodka shots, a foot massage, and tickets to the next Cold Play concert. 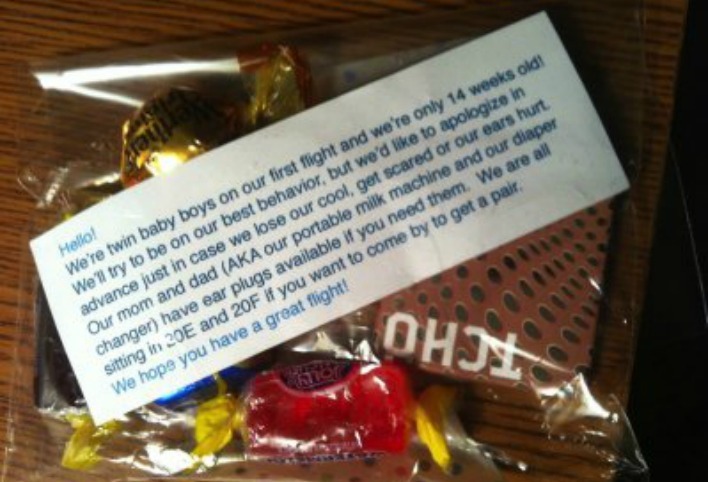 Do we really need to apologies for our babies on the plane? Have we lost all compassion for the sleep deprived suckers who were jet lagged before they even arrived at the airport? Should some understanding go towards the parent who we all know is about to eat with one hand, be thrown up on, and perform a half pike with a double twist just trying to change a diaper/nappy within the confines of the airplane toilet? And who makes the ziplock bags? Who has the time to shop, write and print the note, stuff the bags and remember to then carry them onto the plane? There is not a person on this planet who was not once a child. We get it, sometimes babies cry on planes, sometimes they don’t. While none of us want to sit near the babies (not even those of us who have had four of our own) we all understand that every parent will be doing the best they can to keep their child settled. As a matter of karma and paying it forward I am (to the embarrassment of my children) a perpetual baby stealer/holder while flying. I offer to hold or watch babies while parents do extravagant and self indulgent things like go to the toilet, or fill out their travel documents. I do this because strangers did this for me. I was that irresponsible women who flew with three children under the age of five, the woman with a stroller, a suitcase, a baby in a baby bjorn on my front, and a child in a backpack on my back while a toddler walked by my side. What I didn’t have was an apology note and 25 gift bags for those around me. I gathered that most people knew I had somewhere to go: a wedding, a visit to introduce my baby to its Grandparents, a return home after a long time away. If you are travelling with a baby, there’s no need to apologise, just keep doing your best. We get it, we don’t need a gift bag. What do you think? Do we need to start packing gift bags in our carry-on?